I am very close to have all the blocks of Civil War Bride Quilt finished. Yipee! This block went together pretty quickly. As I was working on it, I kept thinking that something was missing. Like stems, leaves and flowers. Not a single one in the entire block! So I started with a bird and a rooster. And I added a cat. There was something that was nagging at me about the combination of fabrics I was using, so I moved onto the butterflies. I did a little bit of fussy-cutting for the butterfly wings. I made a few sets of wings so I could audition them. These butterflies made the final cut. These ones didn’t. Although very interesting, all I see is raccoon eyes! So you can see from the finished block, the red calico cat is now black, and the blue bird is red. It is always good to keep your options open! Speaking of options, the brochure from The Elly Sienkiewicz Applique Academy is now online! So many great teachers and awesome classes! Time to start checking out all the options! Love your fabric choices. I have all the blocks done, and need to get to the borders one of these days. Wish I was going to academy! I love going to Academy. 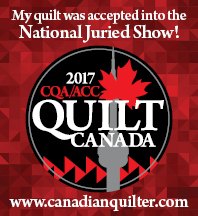 I missed it last year, so I am super excited to be going! What an awesome block even without the flowers, stems and leaves. Beautiful work! I love how you fussy cut your butterfly wings. They are beautiful !! I looked at the academy list of teachers but didn’t know who would be good because I have never attended. I have Jeanne’s recent book and thought about her but didn’t know how much teaching she would actually do since she starches her pieces. Not that it isn’t a technique, but I thought after you learn how to starch that was it. You are a starcher so what is your opinion?? Hi Linda: I am actually going to Elly’s Applique Academy, not Baltimore on the Prairie, which is where Jeanne Sullivan is teaching. You ask a very good question. I have been to five Applique Academies and thoroughly loved each one. I am a firm believer in always learning! I have learned things at academy that totally change the way I look at fabric, thread, quilting and tools. There is always something to learn! I try to choose classes that seem a little challenging to me. The best part is being surrounded by hand-appliquers who share the same passion as you! I highly recommend going. I like the blue bird. Good fabric choice.